Royal Oak, MI – My friend Julia and I started the new year off with a heavy dose of nostalgia since our regular spots were closed for the holiday. As it turns out, Sign of the Beefcarver was a delightful choice. For me it took me back to dinners with my then-future-now-ex-husband’s family when I was a teenager. Every once in a while his family would gather and take up a couple of tables. While I was never a fan of awkward family functions, the deliciousness of the food made the excursion worthwhile. For a gal that grew up with a single dad and a diet of fast food, the juicy roast beef and hearty mashed potatoes tasted like something special. Swirling the soft serve with my spoon and waiting for it to melt kept me busy while the adults talked about their yards, their vacations, and what various cousins were up to. It wasn’t really my family, but sitting there with them on those rare occasions felt like I kind of understood what having one was like. So there was something sentimental about eating there again. For my friend it was a similar feeling. “I used to come here all the time with my grandpa,” Julia said, remarking how special it was for someone else to carry their trays to the table. She and “Papa” would try to sit by the fireplace if they could. “Nothing has changed at all,” she said. Sign of the Beefcarver opened in 1957 as a “California-style cafeteria” in a style that was then considered “modern” American. Guests go down the line, picking out items they want and putting them on plastic cafeteria trays. An area of ice holds tiny bowls of salad, cottage cheese and Jell-O squares. There are several meat options, but roast beef is definitely their staple. A server in a white apron with a big knife slices the meat off the bone and tops it with gravy. There are a few choices for sides and they change throughout the week. My friend and I both got mashed potatoes. She got green beans, which she mixed with her meat and potatoes. I opted for broccoli coated with melted cheese. Deserts are on the line the same way, different kinds of pie and cake placed in little cups and the option to add ice cream. At the end of the line someone else carries the tray to a table and places the food as if you aren’t in a cafeteria at all. There are two rooms in the restaurant, one with television sets and one without. 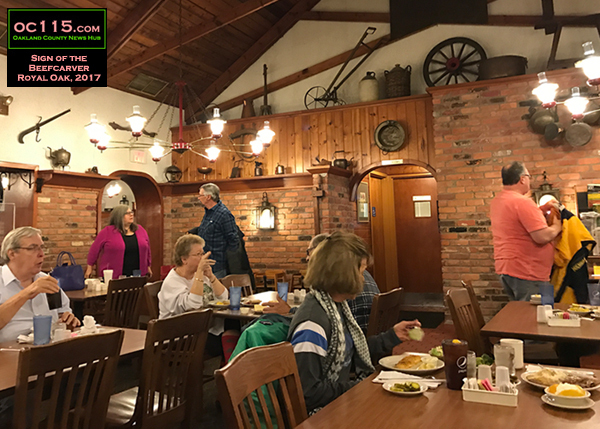 The walls are full of antiques and a photo of the building taken in 1957 hangs over the condiment bar as a reminder that nothing here has changed. The clientele is mostly senior citizens, perhaps due to the old fashioned décor and the lack of booze or games to keep children distracted. It’s just a nice simple place, with simple food. 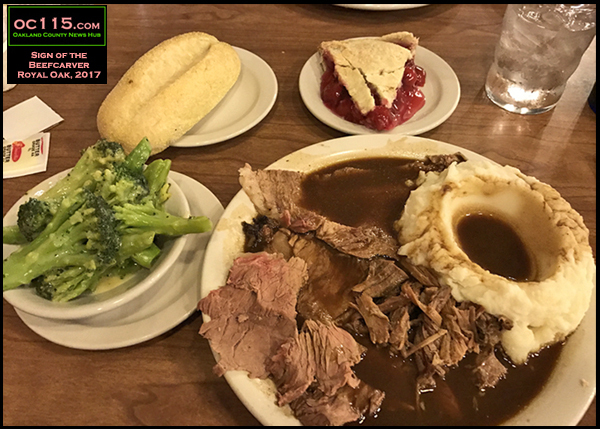 It’s an efficient and affordable meal without any wait and probably the best roast beef I’ve ever had. After 60 years of making it, of course they’d know what they’re doing. The other thing worth mentioning is how nice everyone working there was. It was obvious that courtesy and good service are part of the Sign of the Beefcarver training as employees held the door, checked on us regularly, and seemed happy as they worked the line. Even if you did not have childhood memories of this place, it’s a neat place to go and make some. 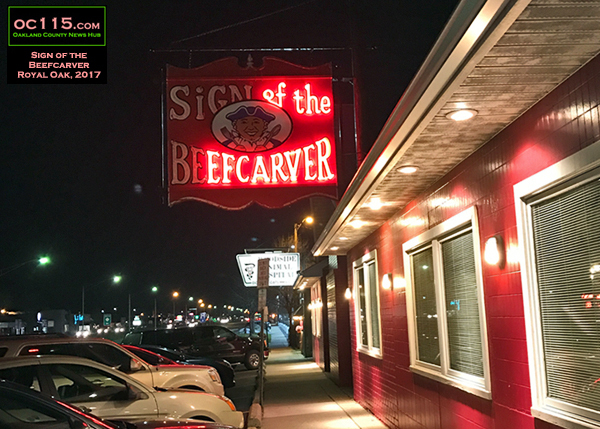 Sign of the Beefcarver is located at 27400 Woodward Ave, Royal Oak, MI 48067. It was a fun start to the new year.